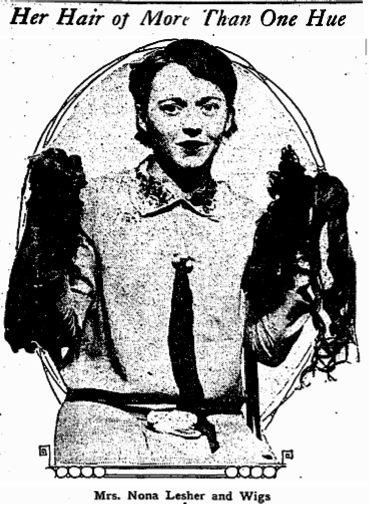 Meet Nona Lesher, the cool 20-something check kiter whose arsenal of multi-hued hairpieces helped disguise her during a spree of bad paper pushing, busted in a market at 305 East Valley Boulevard. But the wigs are only the tip of a hairy iceberg. For among the suspicious items discovered in the room shared by Nona, hubby Harvey (or Harry), half-brother Phil Rohan and pal Mike Garvey at 2048 West Twentieth Street were an unheard of 61 pairs of shoes and twenty hats, plus Harry, Phil and the aforementioned wigs. The men soon became suspects in the November 1 drug store beating death of proprietor A.R. Miles (or A.M. Miller) at 2329 West Jefferson after Lesher allegedly confessed to friend H.S. Walton, "I pulled that West Jefferson job—I hit Miles over the head and when he came to and called me ‘Heinie’ I finished him with my feet." However, Walton later said he had been so drunk that night, he might have imagined the whole thing, had only spoken out because he’d been told charges against him would be dropped if he did, and anyway, he believed the trio was innocent. Still, 10-year-old witness Eddie Yates ID’d Phil Rohan as the youth in a snazzy blue and white sweater who he’d seen dashing from the crime scene. Lesher and Garvey also looked familiar to the boy. Roberta Scriver, sitting in a car outside the drug store, also identified the trio. Simple robbery-murder case with eyewitnesses, eh? But then a cop’s badge was found in Mike Garvey’s possession, leading to the arrest of 77th Street Division policeman George H. Foster, the Wig Gang’s next door neighbor, on charges that he’d used the badge to shake down bootlegger John Sykes for $57 in exchange for not noticing a quantity of liquor stored in a vacant house; Rohan and Garvey supposedly served as muscle on the robbery, and somehow Garvey ended up with the badge. By January, the male members of the Wig Gang had been convicted of murder and sent to San Quentin for life, while back in LA, Officer Foster was thrown off the force and tried on a series of bootleg shakedown charges. But come December 1928, witness Roberta Scriver testified that she’d seen someone else leave the murder scene, one Harry Rosenfeld. The Grand Jury reopened the case, it was noted that the 10-year-old witness was actually watching a movie during the crime, and after begging San Quentin ex-con Rosenfeld to tell all he knew (he snarled he wouldn’t do it, lest he get a knife in the back from breaking the criminal code), the hapless Wig Gang was released after two years and eight months. Once freed, the trio sought $5000 each in payment from the state for their ordeal, while Lesher and Rohan’s mother Carrie testified she’d spent $6000 on their defense and appeals. During this hearing, which was ultimately unsuccessful, an Alhambra Detective offered the hitherto unknown information that their arrest had resulted from a tip from the Wig Lady herself, Nona Lesher. It was unclear if she had remained true to Harvey during his incarceration, but one assumes the marriage didn’t survive this revelation. At least their mother still loved ’em!